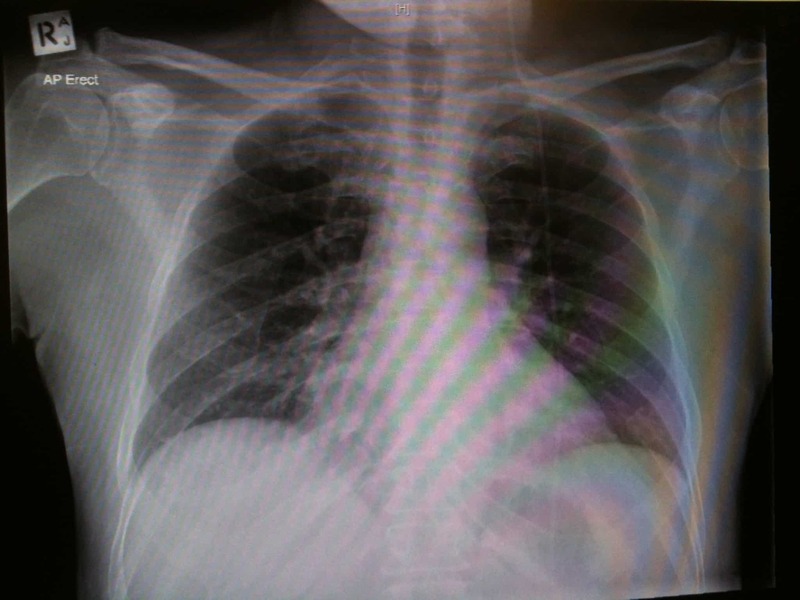 [az_accordion_section] [accordion title=”History” id=”acc-1″]We look at chest xrays every day, but can you tell where the lines & tubes should go? Test yourself with these CXR’s. 1. What lines/tubes are there? Are they positioned correctly? 2. Again, what’s happening here? 3. 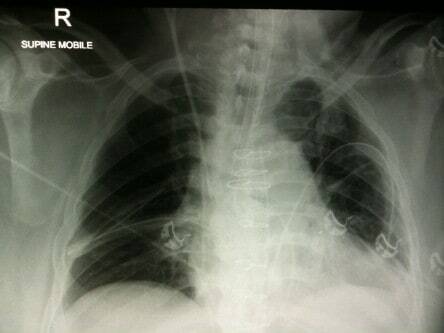 This jumble of hardware is commonly seen after cardiothoracic surgery. 4. What has happened to this patient? [/accordion] [accordion title=”Answer” id=”acc-3″]1. The patient is intubated. The ETT is in a reasonable position. There is a right subclavian CVC, but unfortunately it has crossed the midline & now sits in the left subclavian vein. Subclavian & internal jugular CVC tips should ideally sit in the SVC. On CXR the tip is above the right main bronchus, & usually in the 1st anterior intercostal space above the carina. The tip should not be hitting the vessel wall at a sharp angle. 2. 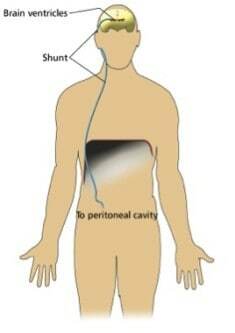 There is a ventriculo-peritoneal (VP) shunt (sometimes called a CSF shunt) in situ, traversing the left side. VP shunt patients can present with complications, so noticing its presence on CXR is important. Common complications include obstruction, infection, disconnection, migration (even down into scrotal sack – eye watering! ), over or under drainage. Beware patients presenting with shunt infection, as they may have a varied clinical state: evidence of overlying soft tissue inflammation through to nonspecific symptoms like confusion or drowsiness. 3. Yes, this patient is post-op cardiothoracic surgery. 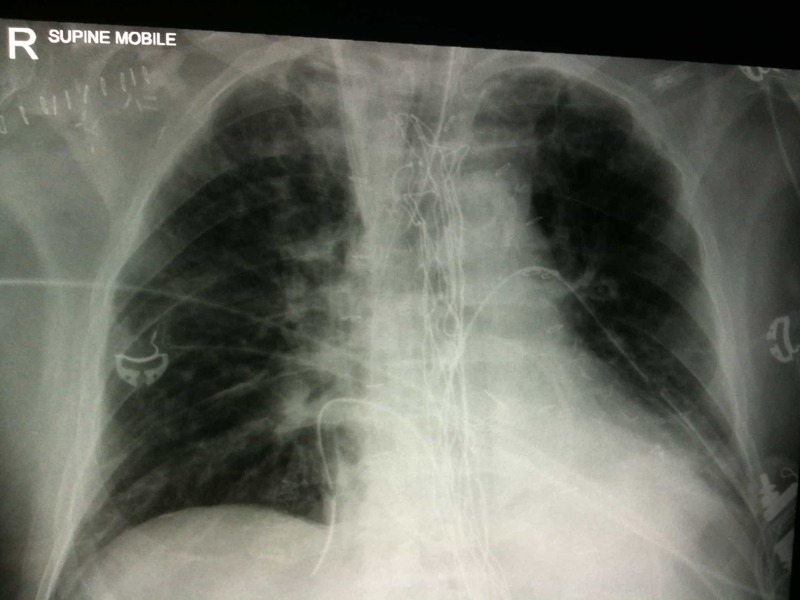 There is a pulmonary artery catheter (or Swann-Ganz) which needs repositioning. There is a right internal jugular CVC. There are bilateral chest drains & a mediastinal drain, all exiting subxiphoid. There are multiple sternal wires visible. The ETT position is a bit low. The nasogastric tube in situ appears to be correctly positioned. ETT position varies with flexion/extension of the neck, such that the tip can move up to 5cm. 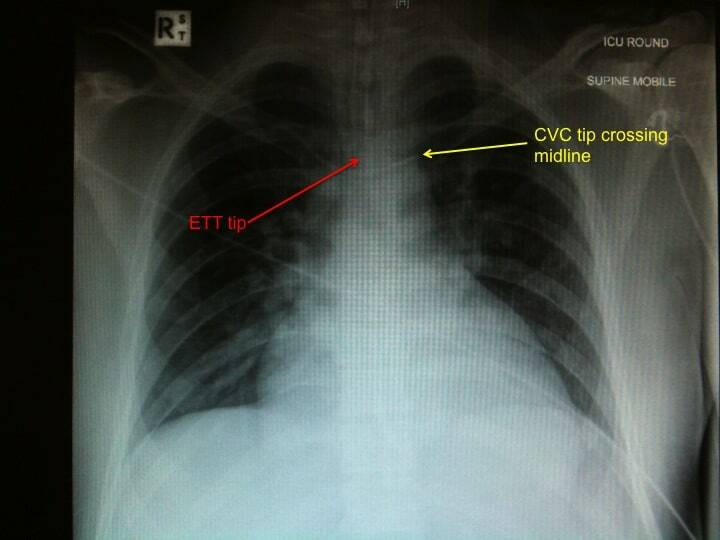 In the neutral position, the ETT tip should be ~5cm from the carina, or between the clavicular heads. 4. This patient has had a sternal wound dehiscence after cardiac surgery. There is an open packed sternum, as showed by the surgical gauze. There has been an attempted pectoral flap repair (clips in the right axilla). There are clips visible on the coronary arteries. There are mediastinal drains, a pulmonary artery catheter, right internal jugular CVC. The chest also demonstrates some left basal collapse/consolidation. Sternal wound infections occur in 0.5% to 4% (depending on the study). Risk factors for this are the usual suspects (hypertension, smoking, diabetes, obesity, long operation) but also have a high index of suspicion if your patient had bilateral internal mammary arteries used for their bypass. http://emcrit.org/central-lines/ From the one & only Scott Weingart. http://lifeinthefastlane.com/education/procedures/central-line/ LITFL is always brilliant, & this is no exception. The video here is for IJ line insertion. For more information on correct positioning of lines & tubes on CXR’s, along with potential complications of misplacement go to Radiopaedia’s page: http://radiopaedia.org/articles/chest-radiography-lines-and-tubes Basically a cheat sheet of where things should be positioned on CXR. http://lifeinthefastlane.com/education/ccc/pulmonary-artery-catheters/ What doesn’t LITFL cover? Great info as always. https://intensivecarenetwork.com/explained-pacing-pulmonary-artery-catheters/ All about pacing Swanns from our very own Oli Flower. http://radiopaedia.org/articles/evaluation-of-endotracheal-tube-position A bit more about positioning of ETT’s on CXR from Radiopaedia. http://www.learningradiology.com/archives2007/COW%20244-Sternal%20Dehiscence/dehiscencecorrect.html# From Dr Herring’s radiology site (new to this FOAMed subscriber) LearningRadiology.